Now Jordan Mechner, the developer who created the original game and worked on the remake, has released a port of the 1984 game for iOS and Android. 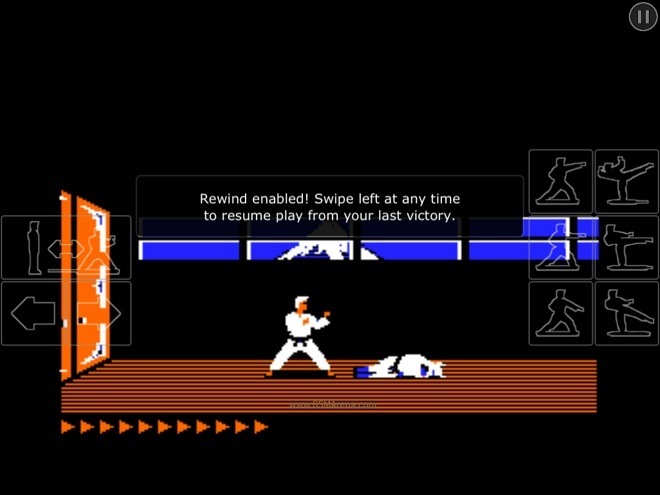 Called Karateka Classic, the game is a blast from the past that lets you relive the classic gameplay on your modern smartphone or tablet. Let us take a closer look at it. 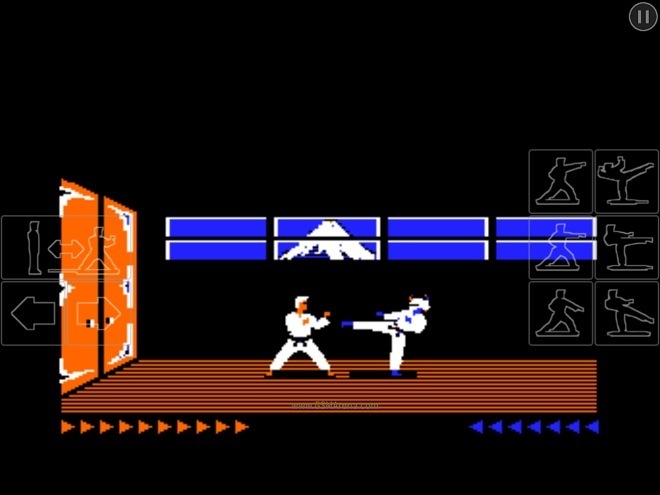 The gameplay of Karateka Classic is identical to the original. You play as an unnamed hero who is out to rescue Princess Mariko who is held hostage in Akuma’s fortress. In your journey, you fight several of Akuma’s henchmen, occasionally his trained hawk and finally, Akuma himself. On the right side of the screen are the punching and kicking button. You can punch/kick straight, above or below. As you play the game, you are constantly facing Akuma’s minions who get progressively harder to kill. You have to employ essentially the same tactics to kill all of them but the later ones absorb more hits and do more damage. Your health recovers slowly but so does that of the enemy. Also, your health carries forward into the next battle so have to keep that in mind. One new addition in this version of the game is the swipe to resume feature. In the original, dying in a battle meant starting all over again, regardless of how close you were to victory. In this version, eventually you unlock the ability to recover after you die. You basically swipe on the screen and are taken back to the last fight you won. This does make the game a bit easier and lot less frustrating. You can always choose to not recover and start all over again if you’re feeling particularly masochistic. As a port, Karateka Classic is well executed and anyone who enjoyed the original would like the port as well. As a standalone game Karateka Classic is still fairly enjoyable as long as you don’t mind the visuals and the sound. As mentioned before, Karateka Classic is a direct port of the original and thus looks identical. As such, the visuals aren’t exactly modern and if you aren’t a fan of classic video games then you are not going to be impressed especially after seeing some of the recent mobile games. Others, however, would be glad that the developers have managed to keep the visuals of the original intact. The developers have actually gone a step ahead and given you the option to choose between CRT and LCD modes, the former being closer to what you might remember but the latter is definitely easier on the eyes. You can also change the screen color to green, amber or full color, which I think is a pointless addition. 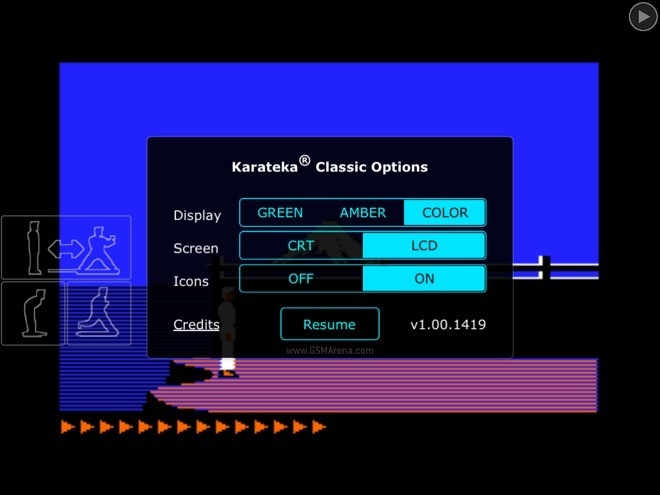 In terms of sound, Karateka Classic borrows all the sound effects from the original 8-bit game. Once again, the developers have gone overboard and included mildly annoying floppy disc reading sounds for a more nostalgic feel but again I think the game could have done with it. Karateka Classic is a faithful reproduction of the original that gained so much love from the gaming community. The developers have done little to mess with the original and have actually improved it with new controls and a resume feature for when you die. Fans of the original are definitely going to love this one but even those new to the game should find it enjoyable.